Turn a horror movie filled with jump scares and fake build ups into a more serious and focused supernatural thriller. Thanks to IFDB user gazza who gave me some valuable tips on how to improve the edit. - Moved the scene of Ellison watching his old interview about Kentucky Blood to the first night in the house. - Removed false build up scene of Ellison hearing someone moving and finding Ashley looking for the bathroom. Also, scene of Ellison and Ashley talking in her room right after that moved earlier in the film. - Ellison phones the police immediately after watching the first reel of film instead of after the second. - All of Trevor's 'night terror' scenes were removed (stupid red herring). - Removed some of Deputy So and So's 'funny' remarks. - Removed most of Bughuul's appearences, especially the 'scary' ones. I don't find it scary and makes its presence less mysterious and scary. - The two nights Ellison wakes up and finds the projector rolling were merged into one night. Also removed the stupid scene of the child ghosts running around him. - Removed the shots showing "Extended Cut Endings' written on the envelop. Too dumb. I really liked the original (especially for the soundtrack), but agree that the numerous clichées and red herrings somewhat watered it down. The editing also gives it a new narrative, which is very enjoyable. So whether you liked or disliked the original, definintely give this version a try! 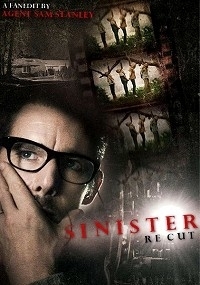 the original sinister was a good movie but Agent Sam Stanley has taken an already great movie and improved on it, by cutting away the fake jump scares has really bumped up the creepy factor of this movieand by re-ordering a few scenes and removing the villain made him more treacherous and more of a puppetmaster lurking in the shadows. if you were scared by the original rewatch this edited version and you could be scared all over again.